Achieved average quarterly production of 8,266 boe/d, approximately 700 boe/d of production was shut-in for the quarter associated with low gas prices and pipeline restrictions. Completed the 100% working interest Dunvegan oil zone in the inactive 03/4-8-62-26W5 vertical well. The well has averaged approximately 45 bbl/d of 39 API oil since early September and has validated inventory on 100% Cequence lands. Secured firm gas transportation arrangements covering the remainder of 2017 including successfully advancing 35 MMcf/d of NGTL service to December 17th, 2017. Net debt is calculated as working capital (deficiency) less the principal value of senior notes. For the three and nine months ended September 30, 2016, general and administrative expenses and funds flow from operations includes $0.4 million and $2.3 million in restructuring charges (2017 – $nil). Funds flow from operations of $3.6 million for the third quarter and $17.7 million year to date increased the previous year and reflects both improved crude oil and natural gas prices, improved liquids yield and the Company’s lower cost structure. Despite a 28 percent decline in benchmark natural gas prices compared to the third quarter of 2016, the Company’s average realized price increased by 7 percent. Realized hedging gains in the quarter totalled $3.65/boe. Comprehensive loss for the quarter ended September 30, 2017 was $3.1 million compared to a loss of $0.9 million in 2016. Year to date, the Company recorded an loss of $92.7 million driven by a $96.2 million impairment charge in the second quarter from the prolonged decline in its third party reserve evaluators’ future oil and natural gas price forecast over the life of the Company’s reserves. Capital expenditures, net of dispositions, were $2.7 million in the third quarter and relate primarily to a Dunvegan recompletion and oil facility work at Simonette. The Company has $68.4 million in net debt at September 30, 2017 which is comprised of $60 million in senior notes and a working capital deficiency of $8.4 million. The working capital deficiency includes $1.6 million in expenditures on decommissioning liabilities that are expected to be incurred over the next 12 months and does not include the current commodity contract asset of $2.4 million. The Company’s senior credit facility of $20 million is currently undrawn with the next scheduled bank review to be completed by the end of November 2017. In the third quarter, the Company advanced the start date of approximately 26 mmcf/d of natural gas transportation to December 17, 2017 from April 2018. The contract reduces the Company’s reliance on short term and interruptible transportation contracts and is expected to improve the netbacks by lowering the cost of transportation or increasing sales prices. Beginning December 17, 2017, the Company will have firm transportation to AECO on the NGTL pipeline system for approximately 35 mmcf/d until March 2026. Since November 1st of 2015, Cequence has been subcontracting 3rd party firm service transportation on Alliance and/or NGTL’s system which included transportation or price offsets of $1.20/boe or higher than standard owned pipeline tolls. Average production in the third quarter of 2017 of 8,266 boe/d was down 4 percent from the third quarter of 2016. Cequence either shut in or curtailed between 1,000 and 1,500 boe/d through periods of August & September associated with low AECO gas prices and pipeline restrictions. Low AECO prices & pipeline restrictions have continued into October with Cequence continuing to shut-in volumes through the month. Beginning November 1, 2017, Cequence has begun bringing wells back online with higher prices and improving pipeline access. Operating costs in the quarter increased to $9.21/boe compared to $7.85/boe 2016. The Company incurred $0.8 million of incremental costs associated with accelerating its water disposal efforts in the Simonette field. The Company is utilizing infield trucking and gas gathering pipelines to transfer water to its 100% owned disposal well. This water disposal effort will be finalized in the fourth quarter with an additional cost of $0.7 million over that same period. The accelerated water disposal effort will reduce long term equipment rentals and ongoing associated transfer costs by $2.5 million per year. Oil and condensate production in the quarter increased by 26% or 256 bbl/d over the same period in 2016 with oil production up 122% to 388 bbl/d. The two Dunvegan oil wells (50% WI) brought on stream in January of 2017 continue their strong performance, with the 9-11-62-26W5 well having produced 95,000 bbls to the end of October. The tie-in of the Cequence operated 5-7-62-25 oil facility, which occurred in July, has provided more reliable well operating times and efficiencies. 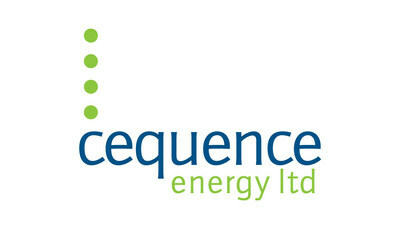 In the third quarter, Cequence completed the 100% working interest Dunvegan zone in an inactive vertical well located at 03/4-8-62-26W5. The well was brought on production September 4th and has produced approximately 45 bbl/d of 39 API oil since that time. This test has validated 100% Cequence interest lands and supports the 24 net locations previously identified on the play. An extension of the Dunvegan oil play West of the 4-8 vertical well has been identified on seismic. This extension may further increase the Cequence net inventory by 10 wells. A 3 gross (2 net) Dunvegan oil program is set to commence in the fourth quarter 2017. The Company has revised its full year guidance to include the results of the first nine months of the year performance and the current outlook for commodity prices. The revised guidance reflects the impact of the low gas prices and pipeline related volume restrictions experienced in the third and fourth quarter as well as the associated capital program since that time. In light of the current commodity pricing environment, the Company expects to focus its winter drilling program on its Dunvegan oil asset. Average production estimates on a per boe basis are comprised of 85% natural gas and 15% oil and natural gas liquids. Net debt is calculated as working capital (deficiency) less the aggregate principal amount of the senior notes. Certain statements included in this press release constitute forward-looking statements or forward-looking information under applicable securities legislation. Such forward-looking statements or information are provided for the purpose of providing information about management’s current expectations and plans relating to the future. Readers are cautioned that reliance on such information may not be appropriate for other purposes, such as making investment decisions. Forward-looking statements or information typically contain statements with words such as “anticipate”, “believe”, “expect”, “plan”, “intend”, “estimate”, “propose”, “project” or similar words suggesting future outcomes or statements regarding an outlook. Forward-looking statements or information in this press release may include, but are not limited to, statements or information with respect to its guidance and outlook: business strategy and objectives; the Company’s 2017 capital program and operational and drilling plans; transportation cost expectations; future production levels and productive capacity; G&A and operating costs expectations; bank review timing; the benefits to be derived from the Company’s hedging program; funds flows; debt levels; and expected future oil and gas prices including marketing arrangements. Forward-looking statements or information are based on a number of factors and assumptions which have been used to develop such statements and information but which may prove to be incorrect. Although the Company believes that the expectations reflected in such forward-looking statements or information are reasonable, undue reliance should not be placed on forward-looking statements because the Company can give no assurance that such expectations will prove to be correct. In addition to other factors and assumptions which may be identified in this press release, assumptions have been made regarding, among other things: the impact of increasing competition; the timely receipt of any required regulatory approvals; the ability of the Company to obtain qualified staff, equipment and services in a timely and cost efficient manner; the ability of the operator of the projects which the Company has an interest in to operate the field in a safe, efficient and effective manner; the ability of the Company to obtain financing on acceptable terms; field production rates and decline rates; the ability to replace and expand oil and natural gas reserves through acquisition, development of exploration; the timing and costs of pipeline, storage and facility construction and expansion and the ability of the Company to secure adequate product transportation; future oil and natural gas prices; currency, exchange and interest rates; the regulatory framework regarding royalties, taxes and environmental matters; and the ability of the Company to successfully market its oil and natural gas products. Readers are cautioned that the foregoing list is not exhaustive of all factors and assumptions which have been used. For the nine months ended September 30, 2017 the ratio between the average price of West Texas Intermediate (“WTI”) crude oil at Cushing and NYMEX natural gas was approximately 16:1 (“Value Ratio”). The Value Ratio is obtained using the nine months of 2017 WTI average price of $49.33 (US$/Bbl) for crude oil and the nine months of 2017 NYMEX average price of $3.05 (US$/MMbtu) for natural gas. This Value Ratio is significantly different from the energy equivalency ratio of 6:1 and using a 6:1 ratio would be misleading as an indication of value. “BOEs” or “barrels of oil equivalent”, a term commonly used in the oil & gas industry, may be misleading, particularly if used in isolation. A BOE conversion ratio of six thousand cubic feet of gas: one barrel of oil is based on an energy equivalency conversion method primarily applicable at the burner tip and does not represent a value equivalency at the wellhead. Within the MD&A references are made to terms commonly used in the oil and gas industry, including operating netback, cash netback, net debt, funds flow from (used in) operations and total revenue. Net debt is a non-GAAP measure that is calculated as working capital (deficiency) less the principal value of senior notes. For this calculation, Cequence uses the principal value of the senior notes rather than the carrying value on the statement of financial position as it reflects the amount that will be repaid upon maturity. Cequence uses net debt as it provides an estimate of the Company’s assets and obligations expected to be settled in cash. Non-GAAP financial measures do not have a standardized meaning prescribed by IFRS and are therefore unlikely to be comparable to similar measures presented by other issuers.